All customers’ adjustments are on board to simplify set-up. Microprocessor based control, can be used in any tension zone (Unwinder, Re-winder & intermediate). To enter data using keypad allows the user to scroll through the selections and values, making set-up easy. Indication and correction will be reliable, and efficient. Close loop control by measuring web tension by two load cells, insures that malfunction or wrong web tensions are corrected. 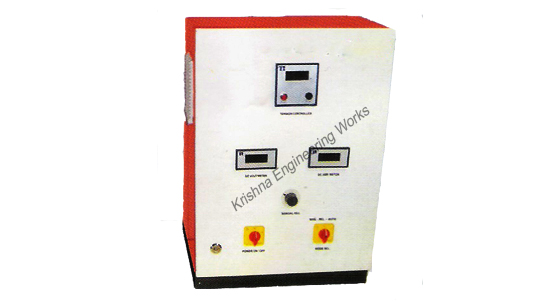 Krishna Engineering Works, a leading manufacturer, exporter and supplier of Tension Control from last 25 years. High quality and heavy duty Tension Control from India. Air Turner Bar Systems are designed and manufactured to suit customers’ particular application. There are six sizes for 90° entry or 180° turnover, with web widths ranging from 100mm to 3 meters, for horizontal or vertical mounting. The units are built as freestanding or bolt-on modules, complete with leveling braces and bolting down holes. They are designed to suit existing machine and site conditions. The framework is rectangular hollow section with specialized corner bracing incorporating the fine adjustment mechanism and mounting for the Turner Bars. Bars are tubular steel with bell mouth air holes, ground, polished and hard chrome plated. Air blow creates an air film assist to the bar. By choosing appropriate mounting positions, a variety of configurations can be obtained to enable a choice of entry and exit requirements. Path rollers are normally aluminum, statically or dynamically balanced. Air for flotation requires 5 CFM per 100mm web width at 10ins to 18ins W.G. depending on web tensions. Fans direct mounted on each Turner Bar can be supplied at the time of manufacture (option). For narrow web widths and special applications air flotation holes can be reduced for using compressed air or arranged as required.